Tens of thousands of people visit the annual ‘Durga Puja’ celebrations in New Delhi every year. 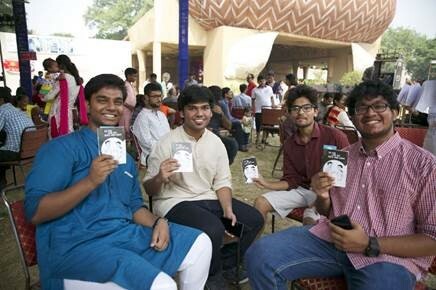 A Durga Puja ‘pandal’ (or a marquee) may seem like an odd place to engage with young people on the issue of mental health, but, in fact, this year it offered a unique environment to talk about how to help and support those in crisis situations and promote self-help and wellbeing. 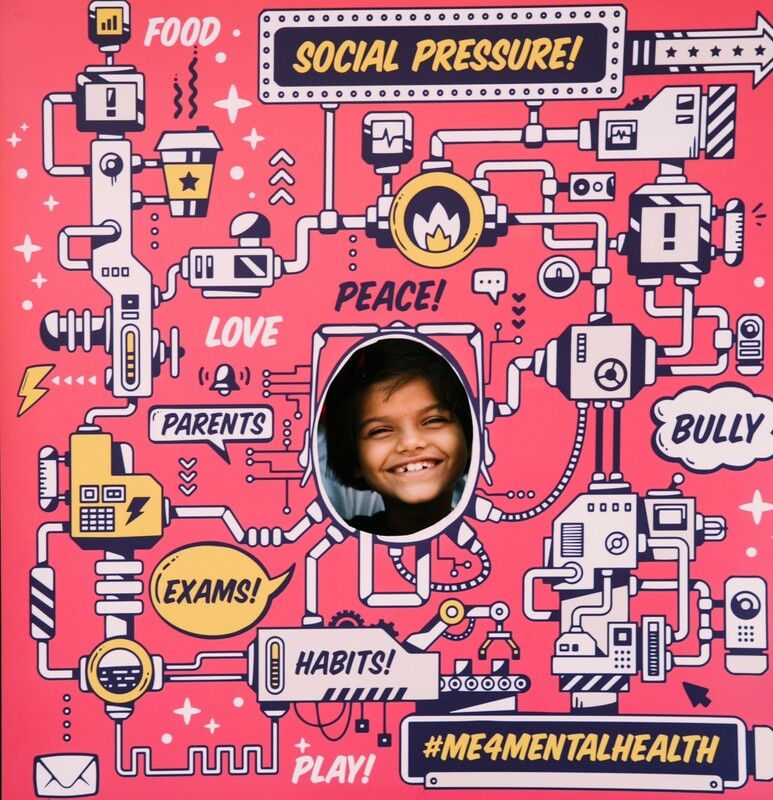 The PRIDE (Premium for Adolescents) Project advocated for positive ‘mental health’, a term that otherwise often carries stigma and shame; through games, public performances and a comic book at the festival. Good mental health makes life better for adolescents and young people. This is the underlying aim and philosophy of the PRIDE project. 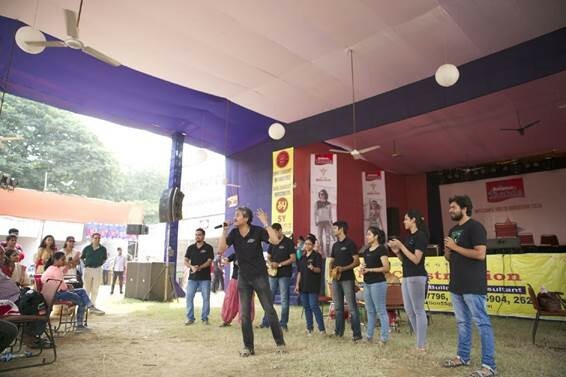 Supported by the Wellcome Trust/DBT India Alliance, PRIDE organized a special booth at the festival on the occasion of World Mental Health Day on 10 October 2016. The event focused on this year’s World Health Organisation (WHO) theme for Mental Health Day, “psychological first aid”. Events at the celebration ran between 6th - 10th October 2016, at the Durga Puja Festival at B-Block Durga Puja, Chitaranjan Park, New Delhi. Founded in a strong belief in the power of the arts to positively engage and impact mental health and wellbeing, PRIDE’s strategy seeks to engage young people through complementary approaches of community engagement and capacity building, using the arts and mixed media. The PRIDE Project is implemented by the Public Health Foundation of India (PHFI), the London School of Hygiene & Tropical Medicine (LSHTM) and Sangath and is funded by the Wellcome Trust, UK. India is in the midst of a mental health crisis, where suicide and self-harm are the leading causes of death among young Indians. Through enabling a dialogue with young people around issues related to mental health, PRIDE aims to tackle many of the psychosocial issues surrounding the poor mental health of adolescents and youth. These include but are not limited to the silence, fear and stigma around issues of gender, sexuality and relationships; violence and abuse; poverty, caste and religion; lack of safe spaces for discussion and dialogue; and embarrassment to seek help. At the festival, PRIDE focused on increasing awareness of basic mental health first aid and to empower especially young people to understand better how to help and support their peers who may face mental health challenges. Visitors to the stall had the opportunity to participate in two jar games that asked about the sources of their mental stress, and activities they engage in that make them happy. One set of jars sought to locate the reason behind most stress-ridden situations, while the other provided options that uplift moods and make people happy. 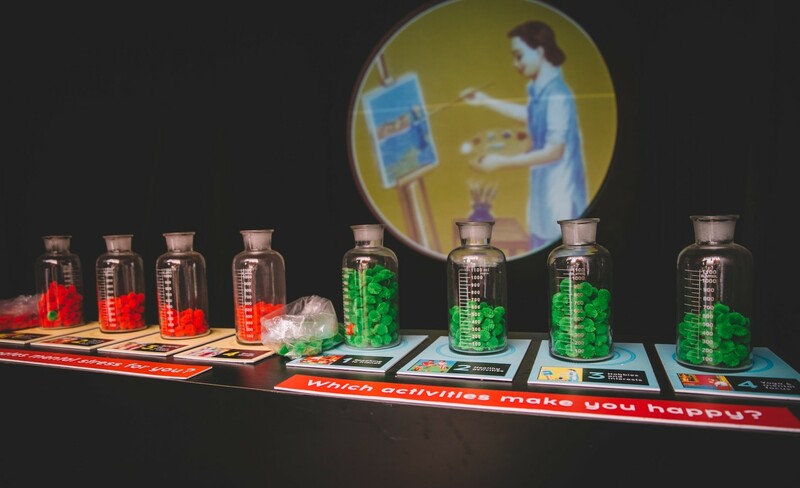 Players put colored balls in the jars of their choosing. At the end of the festival, it was discovered that the jar containing ‘School or office’ related stress was the fullest, and the jar “Speaking to friends” was the fullest as a source of stress-relief and happiness — a testament to the pressures related to our education and employment systems. Nearly 500 visitors also filled in a short survey asking them if they knew how to respond to assisting others with mental health problems and about their own coping habits. More than half the visitors responded that they did not know how to respond if a friend or family member faces a panic attack, anxiety, depression or any other mental health problem. The most common responses to coping with stress were focused on arts-based activities (like listening to music), recreational activities (playing sports and watching TV) and talking to a friend or family member. 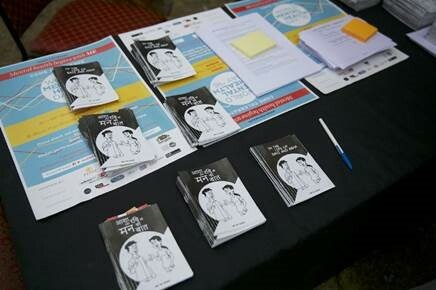 An original comic book for children advocating for help-seeking behavior, “In the Life of Ravi and Asha”, was available for visitors to pick up. The book does not provide a clear-cut storybook ending, but instead highlights resolutions and provides encouragement to seek help in times of need. It was encouraging that in addition to children, many older youth and parents seemed equally keen on picking up and reading the comic too. Young people and children were engaged in different interactive ways through performances and an art competition. 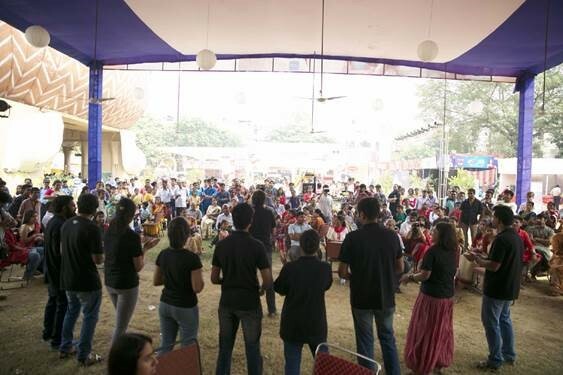 Special music and theatre performances by Delhi-based organizations including Music Basti, Shapno Ekhon and Dribble Academy helped provide a different kind of engagement for visitors to the festival. 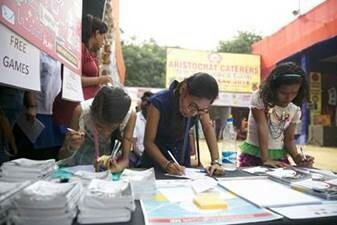 More than 150 children (ages 3 – 17) from the local area also participated in a visual art competition. Themes intended to encourage young people to think about their own mental health included – family and school, teachers and types of challenges or problems faced for students, and how to overcome study and exam stress, activities to relax, how to overcome failure and deal with peer pressure for students. A local publishing house, Hachette participated as a sponsor for prizes. 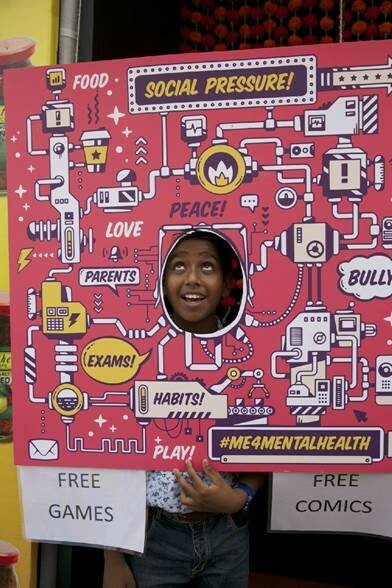 While the activities at the festival were in full swing, the PRIDE team also used social media to engage and inform the general public by posting myths and realities about adolescent and youth mental health on Facebook and Twitter. Photos from the event and a short Facebook Live video were also posted on October 10th on the occasion of World Mental Health Day. PRIDE (Premium for Adolescents) is a research program seeking to develop psychosocial interventions for adolescents with mental health problems in India. Its Public Engagement component aims to enable a dialogue with young people around issues related to mental health through a variety of community-based activities. PRIDE is implemented by the Public Health Foundation of India (PHFI), the London School of Hygiene & Tropical Medicine (LSHTM) and Sangath and is funded by the Wellcome Trust, UK.